Puerto Rico's Power Authority Cancels Controversial Whitefish Contract : The Two-Way The move came after Gov. Ricardo Rosselló called to revoke the $300-million contract awarded to the tiny Montana-based company. Puerto Rico's governor demanded the cancellation of a controversial $300 million contract with Montana-based Whitefish Energy. More than a month after Hurricane Maria hit, a majority of customers remain without power on the island. PREPA's CEO Ricardo Ramos says Whitefish will wrap up some current work before the contract is scrapped, leading to a delay of up to three months before the projects are completed, reports The Associated Press. When Maria slammed Puerto Rico on Sept. 20 as a Category 4 storm, it leveled an already-fragile infrastructure, essentially wiping out power to the entire island. Almost six weeks later, more than two thirds of customers remain in the dark. Tapped by PREPA, Whitefish was supposed to help. But questions arose soon after news broke on Oct. 19 that the Montana-based company was chosen over bigger and better known companies vying for the job. When it was hired, 2-year-old Whitefish had just two workers. Ramos told CNN he picked Whitefish because it did not demand a down payment and agreed to take care of the logistics for workers' housing and food. Whitefish said it was contracting with hundreds of workers to restore transmission and distribution lines, reports The Washington Post. But as NPR's Laurel Wamsley has reported, "(p)ower companies don't generally use contractors to restore electricity but make arrangements for help from other utilities." "Much of the controversy that has surrounded the contract has focused on the high rates Whitefish is charging for labor. The contract shows those labor rates are pricey indeed: $240 an hour for a general foreman and $227 for a lineman. The per diems are also expensive: almost $80 a day for meals, and $332 a day for lodging. Employee flights are billed at $1,000 each way." "For subcontractors, the bulk of Whitefish's workforce, the prices go even higher. A general foreman costs $336 an hour and a lineman, $319. "Usually after huge power outages, electric companies arrange mutual aid agreements with utilities elsewhere to bring in workers to help restore power. But that would most likely have required assurances of payment, and PREPA has been bankrupt since July. So PREPA CEO Ricardo Ramos made a deal with Whitefish, which asked for no such guarantee." See the full text of the contract here. Adding to suspicions, Whitefish is based in the hometown of Interior Secretary Ryan Zinke, spurring him to issue a denial of involvement. He said in a statement Friday, "I had absolutely nothing to do with Whitefish Energy receiving a contract in Puerto Rico. Any attempts by the dishonest media or political operatives to tie me to awarding or influencing any contract involving Whitefish are completely baseless." Earlier in the week, the department also released a statement denying Zinke played a role and saying he only knows Whitefish CEO Andy Techmanskis "because they both live in a small town where everyone knows everyone." On Friday, White House Press Secretary Sarah Huckabee Sanders said President Trump asked Zinke about the contract and the cabinet secretary said he was not involved. "This was a state and local decision made by the Puerto Rican authorities and not the federal government," Sanders said. 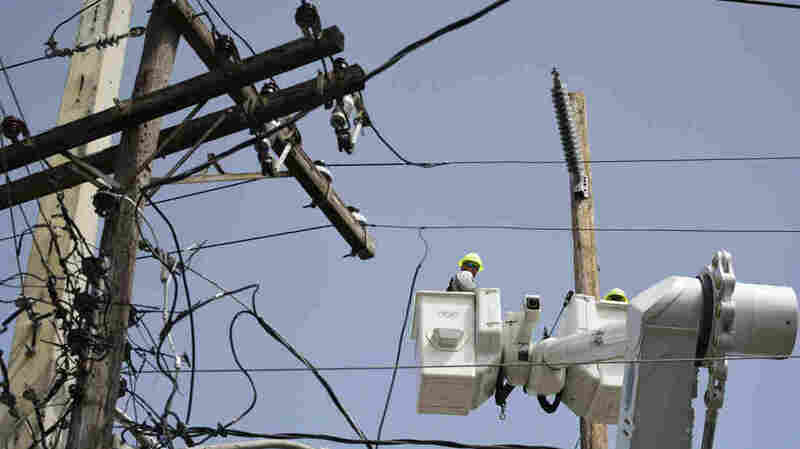 But last week Rosselló asked the Department of Homeland Security's inspector general to review the contracting process, even while seeming to defend Whitefish for "providing important recovery services to PREPA in the aftermath of Hurricane Maria, which completely destroyed the Island's electrical grid system." Rosselló added that the contract "appeared to comply 100% with FEMA regulations." Two days later, FEMA was also distancing itself from Whitefish saying, it "has significant concerns with how PREPA procured this contract and has not confirmed whether the contract prices are reasonable." The statement went on to say, "The decision to award a contract to Whitefish Energy was made exclusively by PREPA. FEMA was not involved in the selection." Members of Congress have called for an investigation into the contract. Raul Grijalva of Arizona, senior Democrat on the House Natural Resources Committee, said on Tuesday, "Congress needs to understand why the Whitefish contract was awarded and whether other, more cost-effective options were available."